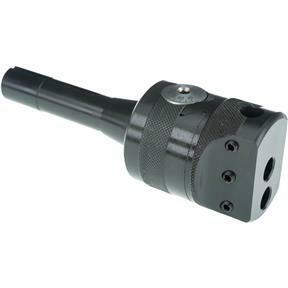 This is a very nicely made boring head with an integral R-8 shank. Finished in black oxide with high contrast white numbers and markings, the dial features graduations in .001" and is direct reading so you bore what you dial! This unit uses 1/2" boring bars, has an offset of 5/8" and comes with setup wrenches. Check out this price! You can't afford not to have one of these on hand! Takes 7/16"-20 drawbar. 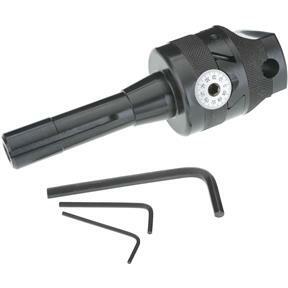 This is a very good boring head, for the money. I've used it several times in my home shop and it has worked very well. I'm not sure that the boring bars are professional quality but they suit my purposes fine.